Originating from Australia, bearded dragon lizards (Pogona vitticeps) are active, entertaining and tolerant of being held. Mature adults are about 18 to 20 inches long, and their life expectancy is up to 10 years. Prpper handling requires that you acclimate with yours reverently. Even after you've bonded, you'll want to avoid handling the lizard by the tail or limbs. Most bearded dragons get used to your company and familiar with being approached over time -- some quicker than others, depending on their individual personalities. Bearded dragons are prey animals, so approaching your lizard from above can stress him, allowing him to think a large predator is attacking. Approach your bearded dragon lizard calmly. Use slow body movements and gradually move closer to his location. If his flap under his chin is puffed out, wait a while for him to calm down before attempting the approach again. Become eye level with your bearded dragon lizard and approach him slowly from a slightly head-on position. Pick up your bearded dragon lizard using a gentle scooping motion, by placing one hand under his belly for support and one hand behind his neck, lifting him upward as he rests in the palm of your hand. Be careful not to lift him by his head or tail. You'll want to use this technique at all times to pick up your bearded dragon lizard. Enclose your hands around him gently as he rests in the palm of your hands, careful not to grip his body firmly. You can also place one hand under his belly and the other gently behind his neck. 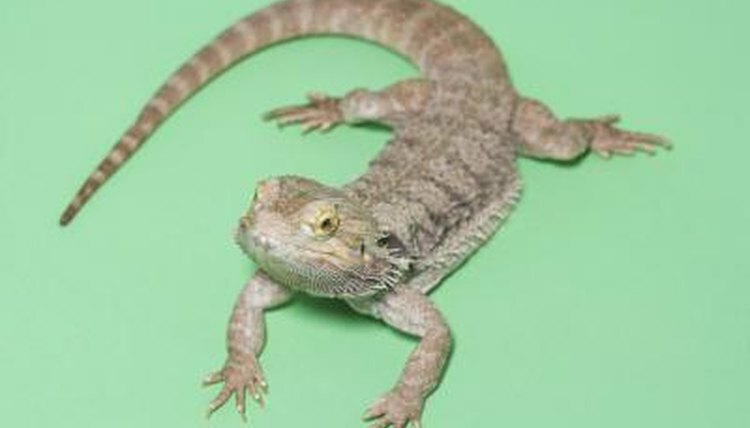 Your bearded dragon lizard's lungs are located behind his two front legs -- avoid squeezing this area, as it may cause internal damage or negatively affect his breathing, even provoking him to stop breathing. Carry your bearded dragon in your hands gently, creating a cupping shape with your hands to prevent him from jumping out of your hands and falling to the floor. Use this preventive technique especially when walking long distance. Bearded dragon lizards are naturally inquisitive and can quickly change from a docile state to an active state, suddenly jumping or crawling quickly to what interests them most. Jumping or falling from furniture and other objects can cause serious injuries, including those you can't see because they're internal.